Thinglink – https://www.thinglink.com/Thinglink is an interactive media platform that empowers students and teachers to create engaging content by adding rich media links to photos and videos. Have students select a photograph that is germane to the subject, and then embed text and videos into the picture which can be shared online. It is a simple web tool that empowers anyone to create and share powerful visuals (infographics, posters) … and design any experience needed! Selecting the best picture (they’re worth a thousand words!) can help to demonstrate understanding better than paragraphs of rambling! Hooks, Gwendolyn. 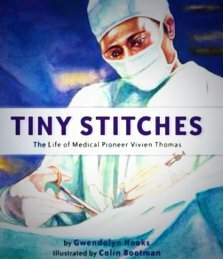 Tiny Stitches: The Life of Medical Pioneer Vivien Thomas. Illus. Colin Bootman. Lee & Low Books Inc., 2016. Medical researcher, and right hand man to physicians who pioneered heart surgery on "blue babies," African-American Vivien Thomas was denied admission to medical school in the 1920's. Undeterred, he took a job as a medical researcher at Vanderbilt, and gained crucial skills needed to work as a research technician at Johns Hopkins, and developed equipment and procedures that made the pioneering heart procedures possible. He even assisted doctors in the operating room. Still he couldn't escape the pervasive prejudice and wasn't honored for his work until the 1970's. The watercolor illustrations evoke the wonder of his work and complete the text. The back matter of the book includes more information on Thomas and tetralogy of fallot, the technical term for "blue babies," a glossary and sources. Bond, Rebecca. Out of the Woods: A True Story of an Unforgettable Event. Margaret Ferguson Books, 2015. Antonio Willie Giroux lived in Ontario, Canada in the early 1900’s with his mother in the boarding house she ran. He was intrigued by the guests, but even more interested in the woods and all its wildlife. But he only saw glimpses of their having been in the forest, as they escaped as far as possible when the lumberjacks and hunters appeared. Once a forest fire threatened, all of the boarding house members stood waist deep in the pond, and were joined by the fauna, which came out of hiding! When the threat was gone, all returned peacefully to their respective homes. Illustrations are rendered in sketched and painted earth tones that complement the text. This picture book biography concludes with a photo and a note by Bond, granddaughter of Giroux that relates additional information on his life. Silvey, Anita. Untamed: The Wild Life of Jane Goodall. National Geographic , 2015. Do we really need another biography of Jane Goodall? Yes, we do! This volume begins with a forward by Goodall, herself, as she sets the stage for the book. Silvey tells Goodall’s story in a strong, storytelling voice with liberal use of quotations. She sets about very successfully to explain challenges, as well as accomplishments, trials as well as achievements. Sidebars of additional information break up the text nicely, and the book is filled with exquisite National Geographic photography. Silvey includes rich back matter, titled Field Notes, including information on chimps and the family she studied, time lines, maps, resource lists, index, photo credits, and author’s note. ​O’Shaughnessy, Tam. Sally Ride: A Photobiography of America’s Pioneering Woman in Space. Roaring Brook Press, 2915. O’Shaughnessy, business and life partner of Ride, tells a touching, heartfelt story of America’s first woman astronaut, like no one else can. Tracing her entire life, O’Shaughnessy, relates the big picture, as well as smaller slices of her life, both admirable, and less admirable stories. Using many primary sources, written in large font, and filled with captioned photographs, this promises to be a standout in the field of works about Ride for children. The back matter includes a cast of characters, timeline, additional photos, credits, and index. ​Smith, Matthew Clark. Small Wonders: Jean-Henri Fabre & His World of Insects. Illus. Giuliano Ferri. Two Lions, 2015. Illustrated in dreamy, muted colors that create mystery and mood, and illuminate the setting of the French countryside in the 1800’s, Ferri begins this picture book with a bugs-eye view of Fabre and his work. In a storyteller’s voice, Smith relates the tale of Fabre, the introverted genius, in child appealing description and quotations. Fabre made his life long fascination with insects a world-renowned career. He overcame poverty as a child, the loss of two children, and adult illnesses, but persisted in his studies, earning a doctorate degree for his groundbreaking work with insects. Not always lauded for his controversial observational methods and findings, he persisted in writing poetry and essays with drawings, all aimed at a general audience, of many insects. At 90, he won a Nobel Prize in Literature, presented by the President of France. This exquisite picture book biography concludes with a historical note that more fully explains Fabre’s methods, contributions, and influences on others (including Darwin); a reproduced photograph of Fabre with a hand written note from Darwin; and a timeline, author’s note, and sources.